A couple weeks went by after Election Day, and I had been meaning to make a Sweet Victory Pie with sweet potatoes, but we were all out of them. How many times did you hear Obama talk about pie? His references to pie are becoming legendary and it’s his favorite dessert. In fact, I read that pie is the whole Obama family’s favorite and Mr. Obama likes sweet potato pie best. I’d made a few pies, but never a sweet potato pie. I went to the Ballard Sunday Farmers’ Market in search of sweet potatoes, but they don’t grow well near Seattle so there were none. Then I saw something I had never seen before — a sweet potato squash? What? of course I was dim enough to ask the farmer, “What do they taste like?” He graciously replied “Sweet potatoes!” Well then it’s a score, and it saved me a trip to the grocery store. 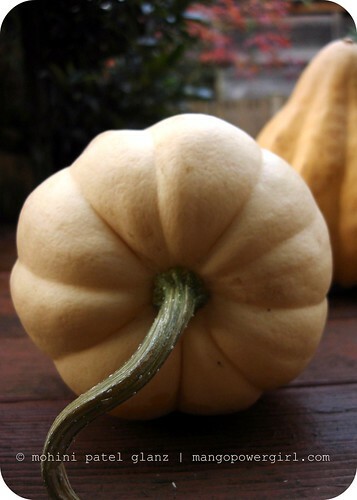 It is squash season after all, and local, seasonal foods are the right choice for so many reasons. There is another side to this story — I really like this farm! Prana Farms are not new to farming, but they are fairly new at our neighborhood farmers’ market. I believe they deserve more attention! Prana in Sanskrit means life. Prana Farms are organic and they have a really nice farmer, Eric, behind their stand at the Sunday market. I love their core values and emphasis on heirloom farming. A few weeks ago, I scored the most beautiful cilantro from them, and for many Sundays this season they have had amazing squash. Prana Farms’ stand at the market is not the largest, but they are working hard to bring us the best produce, giving them an underdog character. You know, there is a reason I like underdogs 🙂 I feel like I am one of them, and haven’t we all been? When you are new at something and you are trying to build a reputation, your only hope is that people give you a fair chance, an opportunity to show what you can do. So what we carried home from Prana Farms was an heirloom variety of sweet potato squash. It was beautiful, came in a few shades of orange, and kinda looked like an acorn. When I cut it up, it had very few seeds. Its flesh was slightly firmer than a sugar pumpkin, so I decided to roast it first. I cored and quartered the two I bought, then baked them at 350 F (175 C) for about 30 minutes. The baked squash did taste a lot like a sweet potato, but it had the texture of a squash. I then peeled and puréed the squash in a food processor, and out came a gorgeous, lemony-yellow purée. The color made me think of using lemon in my recipe, to complement the ginger! It had very little water in it, so I knew it wouldn’t need to bake as long as a typical pumpkin pie. I also like my pies eggless, so I tried two variations for my sweet potato squash pie, one with condensed milk and another with whipping cream. They both tasted great. The condensed milk version was a bit smoother, silkier in texture, and it required less sugar due to the sugar in the milk. This Thanksgiving, Sweet Potato Squash, Sweet Victory Pie is much deserved. I shared our pie with Brian’s family and especially, grandparents who made a special trip from Ohio. I am happy to say this pie is Grandma approved, who herself is a great cook & baker! Here is a picture of the grandparents who are big Obama supporters, with whom we toured Air Force One at the Museum of Flight on Veteran’s day. 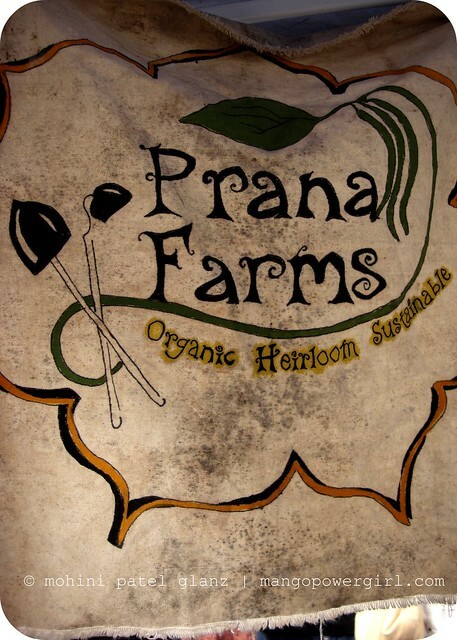 I am hoping that after reading this, Seattle area locals will give another hardworking, small local farm a chance; we are thankful for what Prana have brought to market. All of America are finally getting a president who understands the struggles of local economies, global energy, and building from the bottom up, and we are hopeful as he, too will work hard to give the little people a bigger future. Happy Thanksgiving everyone, and here’s to a sweet victory! 2. In a food processor, pulse the ginger snaps till they are really fine. 3. Add the melted butter and pulse some more to mix. 4. 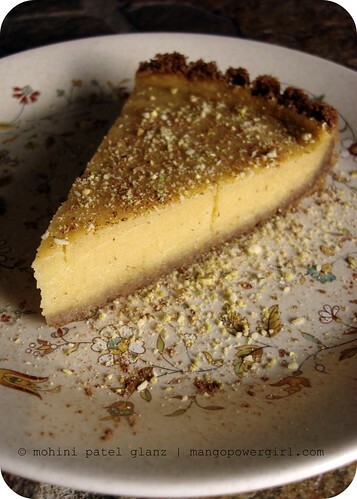 Press the crumb mixture down in your pie or tart pan. Press the mixture against the sides with a flat edged cup or bowl, to get an even thickness. 5. Bake the shell for 5 minutes, or until it comes together, and set it aside. 6. In a big bowl, mix the squash, milk, spices, lemon zest, sugar and lemon juice. Taste the filling for sweetness and adjust sugar if needed. 7. Pour it all in the cooled ginger snap pie crust. 8. Bake on a cookie sheet for about 15-20 minutes, on the top shelf of your oven, until the top starts cracking slightly. Make sure you don’t burn the pie or the crust. The crust will get slightly darker on its edges, but using a cookie sheet will prevent the pie from burning at the bottom. 9. Once it’s finished, let the pie cool to room temperature before refrigerating. 10. Sprinkle on your favorite crushed nuts and serve with a dollop of whipped cream. Ooooh! new discoveries! It sounds like a lovely combo and I really want to make the pie as I love condensed milk…thanks for another informative post and I hope you enjoy Thanksgiving. 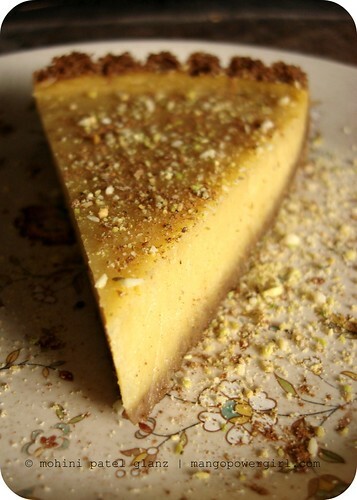 That singular slab of pie is a thing of beauty…nice photo! Those squashes look marvelous and so picture perfect. I love long, curvy stem. I’ve never made a sweet potato pie either, but you’re convinced me to give it a try, with the squash. Let’s hope it comes out as pretty as yours! Sweet potato pie without sweet potatoes? Yes we can! (Sorry, I couldn’t resist. )This pie looks rally lovely. I wish that we had access to such a variety of squash here on Maui, but for now I will settle for living vicariously through your postings. Sweet Victory! That looks really good – maybe I’ll get a baking pan out tonight. Thanks for the recipe! I'm allergic to eggs and finally decided to search for some eggless recipes because I miss pumpkin and sweet potatoe pie!! !